"On the night of 12 August 1943, Flight Sergeant Aaron was captain and pilot of a Stirling aircraft detailed to attack Turin. When approaching to attack, the bomber received devastating bursts of fire from an enemy fighter. Three engines were hit, the windscreen shattered, the front and rear turrets put out of action and the elevator control damaged, causing the aircraft to become unstable and difficult to control. The navigator was killed and other members of the crew were wounded. A bullet struck Flight Sergeant Aaron in the face, breaking his jaw and tearing away part of his face. He was also wounded in the lung and his right arm was rendered useless. As he fell forward over the control column, the aircraft dived several thousand feet. Control was regained by the flight engineer at 3,000 feet. Unable to speak, Flight Sergeant Aaron urged the bomb aimer by signs to take over the controls. Course was then set southwards in an endeavour to fly the crippled bomber, with one engine out of action, to Sicily or North Africa. Flight Sergeant Aaron was assisted to the rear of the aircraft and treated with morphia. After resting for some time he rallied and, mindful of his responsibility as captain of aircraft, insisted on returning to the pilot's cockpit, where he was lifted into his seat and had his feet placed on the rudder bar. Twice he made determined attempts to take control and hold the aircraft to its course but his weakness was evident and with difficulty he was persuaded to desist. Though in great pain and suffering from exhaustion, he continued to help by writing directions with his left hand. Five hours after leaving the target the petrol began to run low, but soon afterwards the flare path at Bone airfield was sighted. 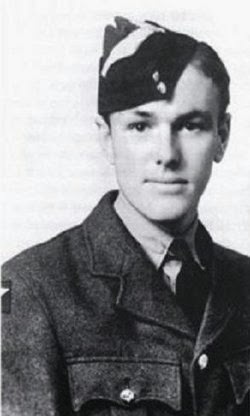 Flight Sergeant Aaron summoned his failing strength to direct the bomb aimer in the hazardous task of landing the damaged aircraft in the darkness with undercarriage retracted. Four attempts were made under his direction; at the fifth Flight Sergeant Aaron was so near to collapsing that he had to be restrained by the crew and the landing was completed by the bomb aimer. Nine hours after landing, Flight Sergeant Aaron died from exhaustion. Had he been content, when grievously wounded, to lie still and conserve his failing strength, he would probably have recovered, but he saw it as his duty to exert himself to the utmost, if necessary with his last breath, to ensure that his aircraft and crew did not fall into enemy hands. In appalling conditions he showed the greatest qualities of courage, determination and leadership and, though wounded and dying, he set an example of devotion to duty which has seldom been equalled and never surpassed." From FSgt. 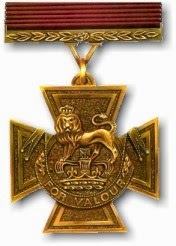 Arthur L. Aaron's Victoria Cross citation, awarded on November 5, 1943. Statue dedicated to Aaron in Leeds.